The second phase of the EuroBasket Women competition, known as the qualifying round, brings together six teams from the preliminary round into one common group. In Katowice the former Groups C and D become Group F.
Montenegro have already booked their ticket for the quarter-finals after beating Croatia (80-61). Iva Perovanovic led the way with a double-double of 25 points and 15 rebounds. Once Latvia regained the lead in the third quarter they did not allow Poland to come back and so won this EuroBasket match with Gunta Basko top scoring with 19 points. They are the second team to qualify for the quarter-finals. 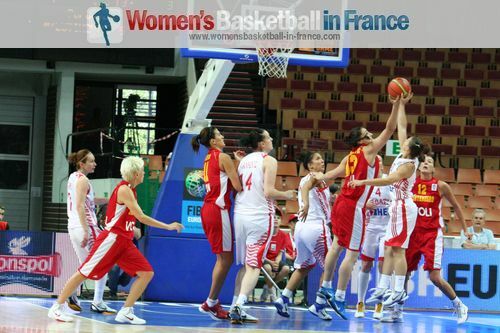 France took the lead for good in the last quarter to win (79-55) against Spain with four players in double digits. Montenegro were never in any trouble in this game despite allowing Croatia the first 4 points of the game. However a 90-second blitz with 7 points put Montenegro in the lead for good with just five minutes played. Afterwards it was show time with Iva Perovanovic (right) scoring 25 points, Jelena Dubljevic 16 points (7 assists) and their captain Jelena Skerovic 15 points. Still it was a team effort with 10 rebounds by Anna De Forge and with 10 points coming from Milka Bjelica and a total of 56 rebounds and 24 assists to win this EuroBasket match. Montenegro have qualified for the quarter-final while Croatia are sitting on the edge of being eliminated. Without Ana Lelas, Sandra Mandir's 14 points and 7 assists were not enough to carry her team. Luca Ivankovic did not help matters by picking up her second foul on the 27-minute mark. 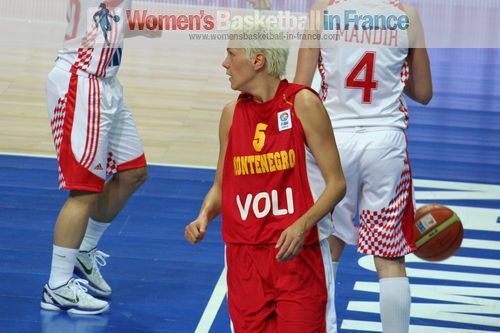 Jelena Ivezic got Croatia off to a good start with the first 4 points of the game. But Montenegro were not rattled and slowly got into the game. With Jelena Skerovic conducting the plays and Iva Perovanovic winning everything inside Montengro scored 7 points in 90 seconds to take the lead (13-8). Stipe Bralic (left), the Croatian coach was required to call a time-out with just over five minutes played. However nothing changed and Montenegro picked up all the rebounds while Perovanovic continued her one-lady demolition act with 15 points as her side dominated the first quarter (24-17). Montenegro controlled the paced of the game all through the second quarter while playing aggressive but well coordinated basketball. They led (45-29) with a minute to go. Yet a three-ball by Lisa Karcic and a buzzer-beater 2-pointer by Sandra Mandir enabled Croatia to reduce their deficit slightly heading to the locker room (34-45). With less than 15 seconds played of the second half Skerovic fired in a three-ball. However Croatia started to defend harder and stopped Montenegro from scoring while they themselves reduced their deficit to 10 points (38-48) with seven minutes to play in the quarter. Croatia managed to hit just three shots from open play and did most of their scoring from the free-throw line, 8-from-10. 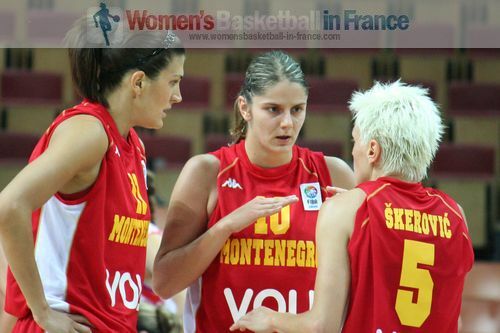 But Montenegro maintained their advantage going into the final quarter (60-48). Croatia did not contest the final quarter. The game turned into a training exercise with all fit players getting on the court. Montenegro ended up winning (81-60) and are the first team to qualify the quarter-final of the 2011 edition of EuroBasket Women. Latvia did not seem to have the energy as in previous games but came out on top by converting many of their steals into points. Gunta Basko fired in some big shots when her team needed them. She finished with 19 points. Despite Zane Tamane not having the best offensive game she took care of the rebounds with 13. Kristine Karklina stepped out of the shadow of Elina Babkina with 13 points while Babkina still had a game high of 7 assists. Poland once again suffered during the second half of the match with Ewelina Kobryn tiring and Elzbieta Mowlik not scoring. As a team they defended well but lack of fire power and Latvia's knack for forcing turnovers came to hunt them down the stretch. With this victory Latvia join Montenegro in the quarter-finals which just leaves two places left in group F.
Latvia did not allow anybody time to get into their seat as they raced to an (11-5) lead with just three minutes played. After a time-out by Dariusz Maciejewski, Poland rallied back. With three minutes remaining in the quarter they trailed (12-14). 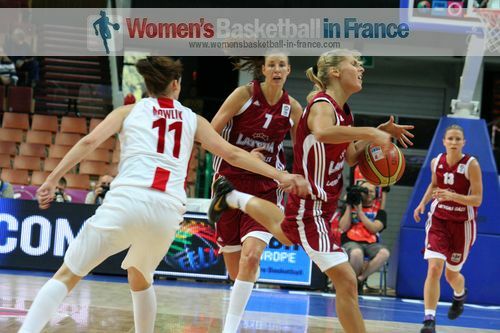 Poland continued to attack and with 90 seconds left in the quarter Agnieszka Kaczmarczyk put Poland in front. It was then the turn of Latvian coach George Dikeoulakos to call for a time-out. The battle in the paint became more and more intense with Poland just holding on to the advantage (18-17) at the end of the first quarter. Back to back treys by Elzbieta Mowlik almost had the roof blown away as the home fans went wild. 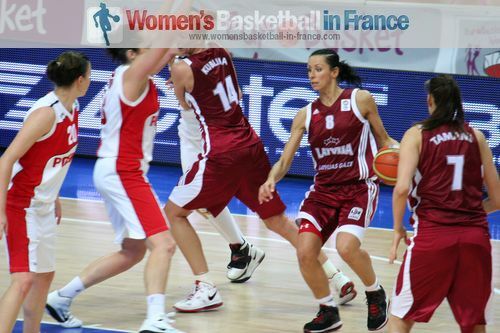 Sabine Niedola was carrying the Latvian team offensively but Poland had the upper hand leading (28-23) after 24 minutes. Nothing was going right for Latvia. They used up their second time-out. Yet it was Ewelina Kobryn from Poland who scored with an And-1 (31-23). Dikeoulakos' expression was enough for his players to refocus and hit their hosts 6-0 to make it a 2-point game. Yet the final minute was scoreless as both sides were unable to create any openings. So Poland went into the locker room in front (33-29). Latvia then accelerated the pace and picked up all the lose balls while scoring 4 more points to regain the advantage (36-33). The Polish head coach had no choice but to use an early time-out, just two minutes in the quarter. Kobryn's response to the coach was to score a basket by force in the paint on the very next play. The rest of the quarter was counter-attack after counter-attack with Latvia doing most of the scoring off turnovers to regain the lead (46-40) going into the final quarter. The Polish fire power of Mowlik and Agnieszka Kaczmarczyk gave the Latvian coaching staff something to think about as they called a time-out with Poland trailing (45-48) with over seven minutes to play. Kristine Karklina and then Gunta Basko hit big shots from the land of many to once again give Latvia some breathing space (54-45) with just over four minutes remaining. Poland ran out of ideas and Latvia controlled the last three minutes to win and book their ticket for the EuroBasket Women 2011 quarter-final. The game started with a little drama when an official awarded 2 points to Sandrine Gruda although the 24-second clock buzzer had sounded before she shot the ball. Later on the score was disallowed and the two teams continued to neutralise each other making scoring very difficult and basically traded scores all through the first quarter. However the physical nature of the game saw Laia Palau from Spain pick up 3 fouls in less than five minutes. 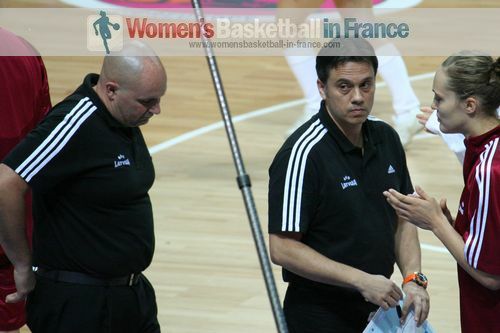 For France Clémence Beikes was also in early foul problems with 2. Sancho Lyttle scored 7 of her team's first 11 points before she also had to return to the bench due to foul problems. 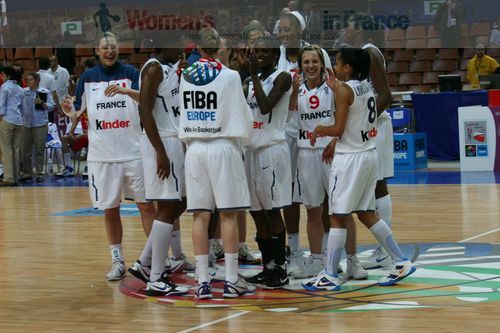 France edged the first quarter as Edwige Lawson-Wade somehow managed to get a shot off while knocked to the ground. The ball went in and then she hit the free throw (17-15). With Palau on the bench, Spain did not have anybody to take a buzzer beater in the last 1.7 seconds of the quarter. 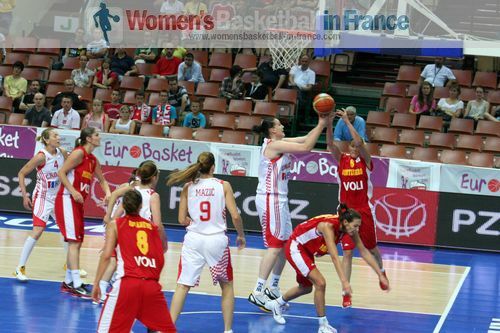 France finally broke the stale mate between the teams three minutes into the second quarter with a Emilie Gomis drive. 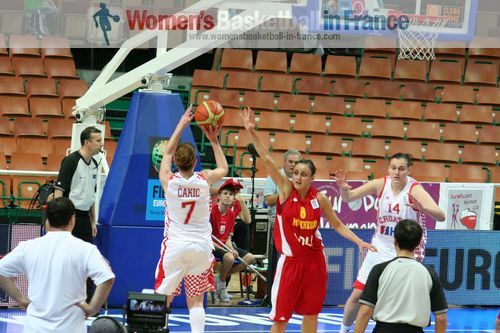 Then on the very next play with a steal by Céline Dumerc France added another 2 points (25-19). José I. Hernández called an immediate time-out to stop the French momentum. Afterwards Marta Xargay from Spain who had a face mask got knocked on the nose again and returned to the bench for treatment. France lost their offensive momentum as once again the teams neutralised each other. Lyttle returned for Spain while Alba Torrens (left) and Anna Cruz regained their scoring touch. Pierre Vincent decided he needed a time-out with 2:10 left to play with his team still leading (28-25). Emméline Ndongue scored for France. Yet shortly after she went down awkwardly and had to be helped off the court. It was Anna Montañana who closed the scoring in the first half by concluding a Spanish fast break for her side to be only 3 points down (27-30). As the intensity picked up both coaches changed their line-up on the court. The criss-cross continued with the lead changing hands several times before Spain opened a little gap (48-44) with 90 seconds left till the end of quarter. 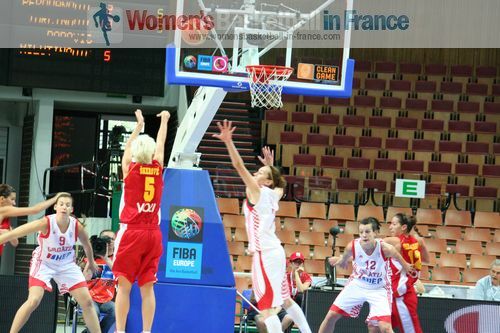 France were back to within 2 points as Gruda took her time before using the backboard to bury a mid-distance jumper. Spain still went into the final quarter with the lead (48-46). 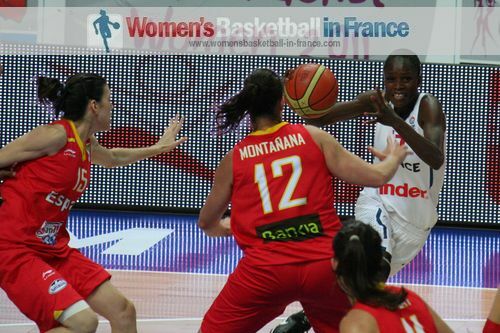 Isabelle Yacoubou-Dehoui and Gruda scored within the first 45 seconds of the final quarter for France to get the lead back. France were moving the ball around quickly and playing aggressively in the paint. Lyttle was called for her 4th foul with just under eight minutes left to play. Dumerc (right) was beginning to impose her style on the game and France went 10 points clear (58-48) with 6:26 left to play. The Spanish coach was left with no choice but to call a time-out because his team had not only conceded 12 points but also not scored in almost five minutes. But Spain did not come back and lost for the second time in this EuroBasket Women campaign as France finished with a 21-7 run.